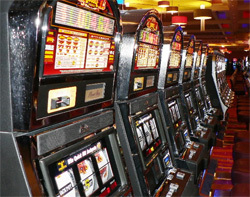 Slot machines are only pure luck and are the most rent able for all casinos owner. They are mainly for entertainment purpose. Let’s look at the average percentage pay out of a slot machine. Most slot machines vary when it comes to the pay-out percentage. Online slots typically range from 96% to 98.5%, although please remember these numbers represent the pay-out percentage across the total lifespan of that particular game. Typically the high limit slots provide above average winnings and a higher pay-out percentage than those which accept a smaller denomination. Does this mean you should be playing the high limit slots? Not at all. Regardless of whether the machine has a higher pay-out percentage or not does not mean you should increase your betting limits. Although the pay-outs on the higher denomination slots are enticing, these games will definitely cost you more over the long haul, especially if you can’t afford to play them. Besides, do you really want to go broke on three spins or would you rather be able to enjoy yourself over a few hours of entertainment. One of the most famous systems in gambling is the Martingale technique. It says that, if you lose one bet, you double the wager on the next bet. The Martingale assumes that if you lose one hand your odds of winning will be higher on the next hand. By doubling your bet you have the possibility of making a profit. Unfortunately hundreds of thousands of bets at online casinos are not enough to even out the law of averages. Another system which is essentially the Martingale System in reverse would have the player halve your bet after every loss, and then double it when you win. This system is just wrong for the simple reason that if you double your bet after you win a hand, you will eventually lose your bet at some point. This system can produce a fast profit if you get a crazy run of cards, but most often will result in you losing your credits faster than your usual rate. The thing to remember here is that it isn't a real strategy if the strategy doesn't actually increase your chances of winning on a spin.